Home Weekend WTF? Weekend WTF: Accidentally Vegan Meat Product? In preparing a recipe for a loved one, I realized that I’d need – ugh – bacon. Resenting that I’d have to actually purchase a big gigantic batch of bacon for the little bit that I’d need, I was told to look in the salad aisle (?) for bacon bits. Since I live without pork on my fork, I’m not familiar with where pork is located in the store and decided to at least look to see what I could find. “Contains no meat or animal fat.” Ha! My bad. They’re not bacon bits. 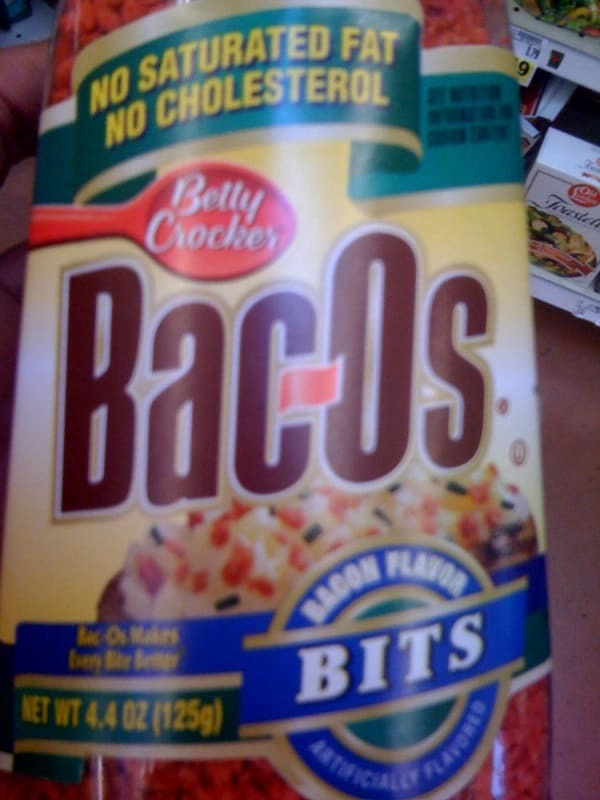 They’re “bacon flavor bits”… “artificially flavored,” of course. No saturated fat, but trans fat. No cholesterol… because there’s no meat in them. 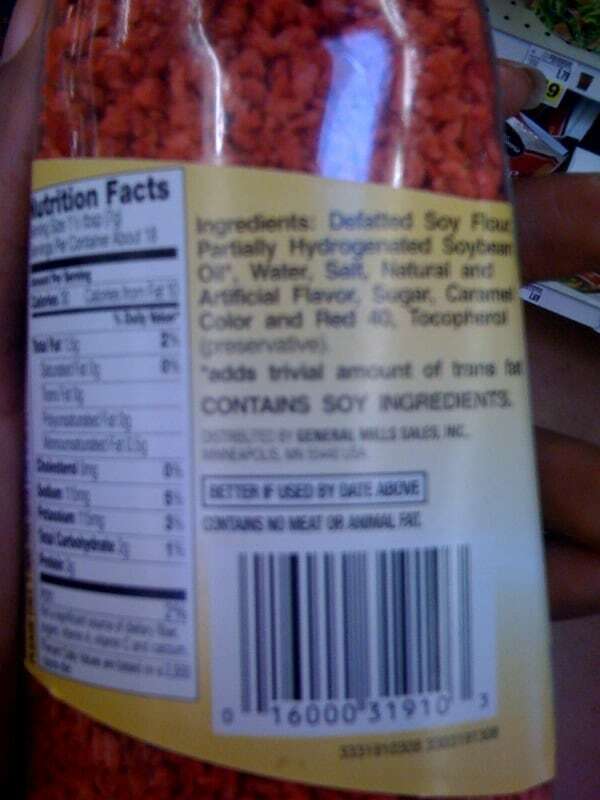 Just soy and artificial bacon flavoring… that doesn’t really taste like bacon, if you think about it. Someone- anyone – pleeeeeease tell me I’m not the last person on Earth to know that these didn’t actually have bacon in ’em! im still trying to figure out what the other NON meat ( meats) are like Chickenless Chicken, and all that…it all just seems wierd to me. I have to be honest, I would’ve bought some real bacon (turkey). But this mess here, I would’ve guessed it was at least made with pig nose. Gross. LOL When I’m cooking for others, I don’t play the “switcheroo” game – if they’re expecting pork in the dish, I won’t cheat them. I also won’t eat any of it, LOL! This is defitely news to me. Eww. I remember growing up those Bacon bits were all the rage to put on your salads & baked potatoes. Gross! Luckily I’m not a bacon person anymore. LOL. I did know this. I haven’t eaten bacon in 14 years but I actually noticed this once when looking for salad ingredients for a salad for someone else…. I didn’t know that! Huh. I don’t think we ever ate those in my house when I was growing up but I think I’ve had them at salad bars before. Blech. At the Albertson’s that I shop at, they actually have bacon in the meat department, where you can buy it by the pound (or quarter pound, if you’re me). I’ve gone and bought a slice or two that I needed for a recipe. Saved me a TON of money, esp. since I wasn’t going to eat any more than I bought. You should check and see, should you need bacon in the future, if your local store carries it the same way. You might be. When I went vegetarian in 2000, I went to Wendy’s between my jobs. I asked for the ceaser salad, forgetting that it came with bacon bits. When I went to return it the manager told me that it was imitation. I didn’t believe him so he brought out the bag. I’ve been all over it ever since. I have a recipe for ‘facon’ if your interested. @Serenity…facon recipe? I am intrigued. I try my best not to eat a lot of processed food (the shorter the ingredient list, the better), so having a recipe for these types of things would be awesome.